Seventh International Dyke Conference (IDC7) | Geoconferences (WA) Inc. I would like to acknowledge and thank Geoconferences (WA) for awarding me the JH Lord Travel Grant allowing me to attend the 7th International Dyke Conference in August this year. This meeting occurs every five years and covers a wide range of aspects related to mafic dyke swarms and Large Igneous Provinces. The title of my presentation was ‘ID-TIMS U-Pb Geochronology of the Tayatea Dyke Swarm of Australia: Identifying Australia’s Nearest Neighbours in the Proterozoic’ and was accepted in the theme ‘The role of giant dyke swarms in reconstruction of supercontinents: progress, problems and potential’. I presented new geochronology of the Tayatea Dyke Swarm of Tasmania and constrained passive rifting margins in the Proterozoic. These precise ages allow for the matching of potentially adjacent cratons or their ‘nearest neighbours’ during the rifting of the supercontinent Rodinia. The main findings of my presentation were well received at the conference and allowed me to present my new data and receive feedback from world-leading professionals. The IDC7 environment enabled myself to network with potential overseas ventures and has inspired me to pursue further studies in geology. As my first conference and international presentation this experience was invaluable and beneficial to the development of my findings. 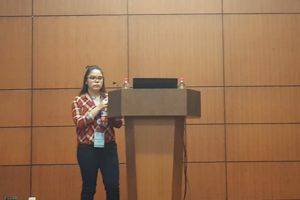 Finally, I would like to thank Geoconferences (WA) for their support through the JH Lord Travel Grant that enabled my attendance and presentation at the 7th International Dyke Conference in Beijing.